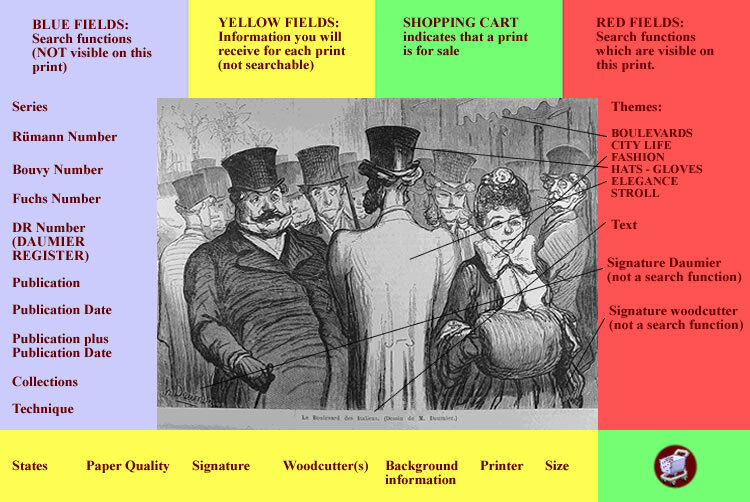 HOW TO USE THE SEARCH FUNCTIONS TO IDENTIFY EACH OF THE OVER 1000 DAUMIER WOOD ENGRAVINGS. Series The name of the series is visible above the image (in most cases). Note that unlike lithographs very few woodcuts carry series names. DR number Stands for DAUMIER REGISTER, the digital work catalogue you are looking at. It is the most recent work catalogue of Daumier's oeuvre. The number refers to the number in the DAUMIER REGISTER. Woodcuts are numbered between DR 5001 and DR 6110. Publication This is the name of the newspaper, magazine or book in which a woodcut was published (e.g. Le Charivari). Publication date It is the date of publication of a print in a newspaper or book. In most cases you will find the exact date (Day/Month/Year). But since some papers like the Petit Journal Pour Rire carried no date, we occasionally had to refer to the publication number of the newspaper, instead of the date. Sometimes we were able only to estimate the publication date. In some cases we could only find approximate dates or the year of publication. For the albums, we supply the year of publication. Collections For each woodcut you will see the museum or collector owning this specific print, with indication of the paper quality, state and where it was possible detailed information about the previous collectors, like Gaston-Dreyfus, Cognacq etc. Collections marked as "Private Collection, nr...." may be possibly contacted through us, if necessary. One or more photographs are supplied for each print and the provenance of the picture(s) will be mentioned. All information contained in this section has been supplied by the owners of these prints. The DAUMIER REGISTER cannot be held accountable for any mistakes. Signature woodcutter(s) Many of Daumier's woodcuts show the signature of the woodcutter who executed the drawing on the wood plate. b) There is a describing text under the print, given by one of the work catalogue authors. We are showing these texts in parentheses because they are not original texts. c) The text under the print was given by the publication. d) There are several texts under the print. The reason being that the woodcut was printed in several publications and was attributed a different text by each publisher. We are listing all of these texts . e) There is a text under the print which is not descriptive. This is often the case when a woodcut was used as illustration in a book and was inserted in the text of the book. Some of the authors of work catalogues list these texts, because they could be helpful for identification of the woodcut. These texts are also listed in the DAUMIER REGISTER. Shopping cart The sign of the shopping cart indicates that this woodcut may be available for sale. By clicking on the shopping cart you will be able to ask for a price and details. - Collectors can sell their prints here. CONTACT US for details. If you are interested in buying a print that does not have a shopping cart, ask us anyway and we might be able to find it for you. Size The image size (NOT sheet size) is given in mm in the German and French version and in inches in the English version of the DAUMIER REGISTER. States Each print is described by one ore more states. Since woodcuts have often been printed in different sizes and variations we are showing these variations in the description of the states.